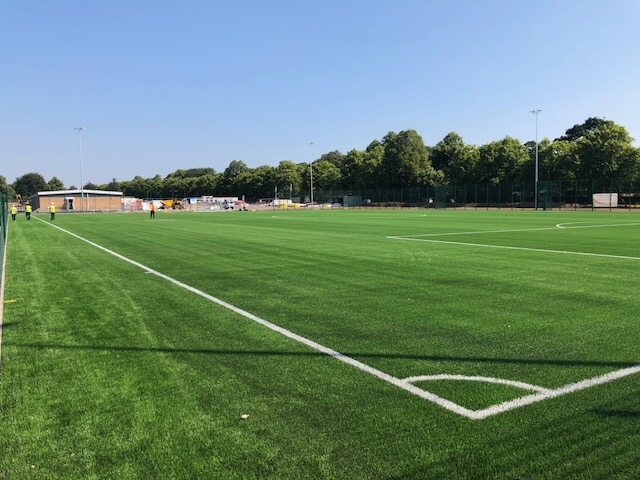 COMPLETION of 4 new state of the art football hubs is just months away, as part of a major ₤20 million investment in grassroots football across the City. The 'Parklife' project is a partnership between Liverpool City Council, local football leagues, the Premier League, The FA, the Government, the Football Foundation and Sport England. It will see the creation of 12 floodlit 3G pitches, as well as health and fitness and coaching facilities; representing a major step change in grassroots football provision across the City. The Premier League, The FA, the Government are investing ₤12.7m through their charity, the Football Foundation, with the remainder coming from the City Council. The hubs will be used to host, both formal league fixtures, on weekends and recreational / informal games during the week. 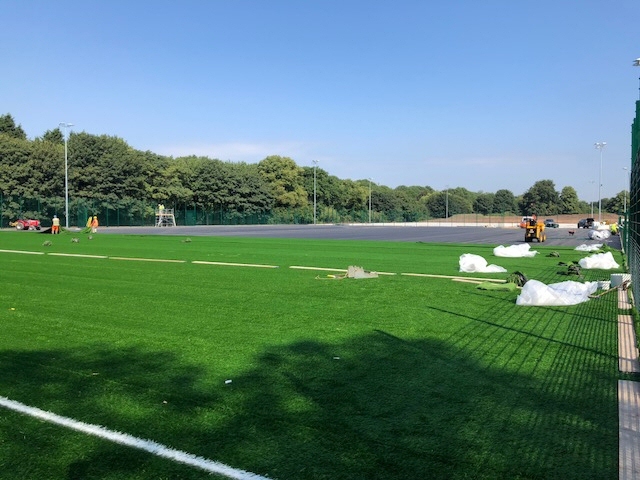 The 1st 3 sites at Jeffrey Humble Playing Field (Fazakerley), Simpson Road (Woolton) and Heron Eccles (Allerton) will be handed over to the City Council and ready for use by end of September once the final fit outs have been completed. The remaining hub site at Jericho Lane Playing Field (Otterspool) will be ready at the end of October, once ground conditions at the site have been resolved. In the meantime, clubs will use existing facilities before transferring across to the new sites ahead of the winter, when existing pitches are often waterlogged or frozen. Mayor of Liverpool, Joe Anderson, said:- "Liverpool is the spiritual home of English football and the creation of these four football hubs will transform the grassroots game in the City. For the 1st time, we will have state of the art facilities that will help us to develop the next generation of Gerrards and Rooneys." Dave Pugh, Chief Executive of the Liverpool County FA:- "We have been working hard with the Liverpool Grassroots Steering Group, Liverpool City Council and The FA to develop this project, which will see a huge investment in the City for grassroots football." ► Wavertree:- ₤350k for a new 3G pitch. ► Broadgreen School:- ₤345k for a new 3G pitch. ► St John Bosco (Croxteth):- ₤1m for new 3G pitch and ancillary facilities. ► Carr Lane East (Croxteth):- ₤1.5m for new grass pitches and changing pavilion. ► Anfield Sports and Community Centre:- ₤2.2m for new 3G pitch and ancillary facilities. ► Walton Hall Park:- ₤350k for a new 3G pitch with the County FA. ► Jeffery Humble Playing Field:- ₤850k for new changing pavilion. ► Bill Shankly Playing Field:- ₤800k for a new changing pavilion. ► EFC Community Hub:- ₤820k for new community facility. ► Archbishop Beck School:- ₤350k for adaptations to sports hall to accommodate disability football. 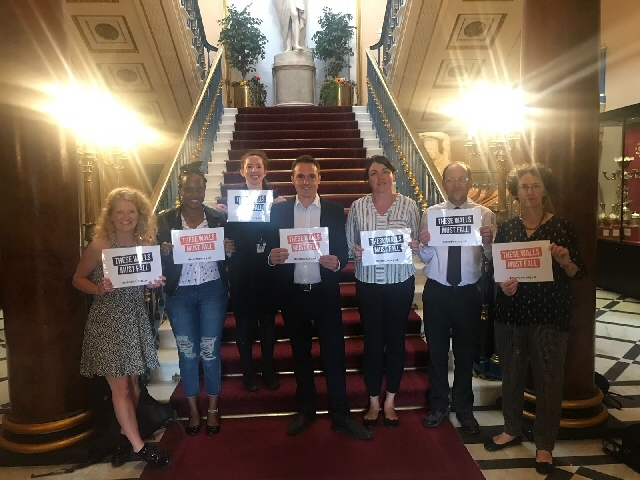 LAST night Liverpool City Council passed a cross party motion against immigration detention and in support of the local:- 'These Walls Must Fall' campaign. In a sign of a growing, community based resistance to immigration detention, Councillors from all 4 parties:- Labour, Green, Lib Dems, Liberals, who have proposed a motion that called on the Government to end indefinite detention, and that the system was:- "inhumane" and "not fit for purpose." Cllr Richard Kemp CBE, leader of Liverpool Lib Dems and one of the sponsors of the motion said:- "Any Country should be judged by the way it treats people within its borders. A civilised Country treats its citizens and visitors with personal respect and with respect for the human rights of all people. The UK shamefully fails to act in a civilised way when it detains people for unspecified periods who have broken no law here or elsewhere." As with other aspects of the Government's hostile immigration policies, recently immigration detention has been in the public eye like never before. Members of the Windrush generation were detained or threatened with detention, and in recent days the Red Cross released a major report calling for an overhaul of the UK's immigration detention system. Conditions are such that detainees suffer mental health problems which has lead to suicide attempts. And while child detention has decreased significantly, it continues:- 1,649 children, 600 of whom were under 11, were detained here since the Government officially ended child detention in 2010. Chelsea Ningabire, an activist with the These Walls Must Fall campaign in Liverpool, said:- "I would like to thank the City Council for supporting our campaign. Detention is affecting many people's wellbeing, and I am campaigning with These Walls Must Fall because I saw friends who have been detained, how detention have affected them, and I live everyday in fear to be detained too. Nobody should have to suffer this way just because they come from another country." 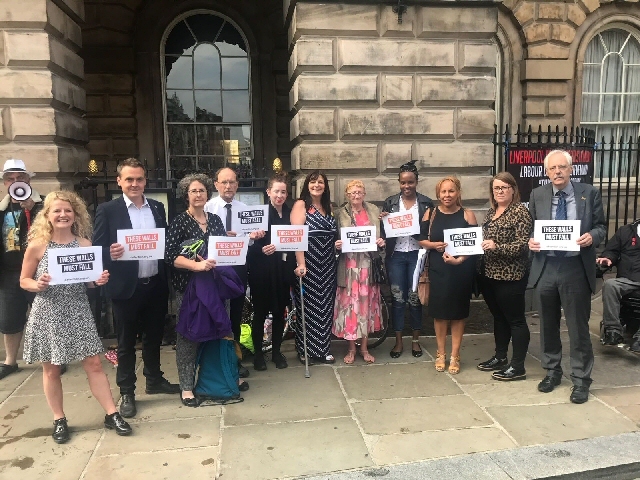 Hattie Ditton, Casework and Advocacy Coordinator at MRANG, a charity that supports refugee and asylum-seeking women in Liverpool, said:- "MRANG supports the campaign because indefinite detention is futile and cruel. Imprisoning a vulnerable person inside an institution without knowledge of when she will be released is torturous and results in a rapid deterioration of their mental health. No one should be driven to contemplating suicide as a result of a so called administrative process, yet this is the case for many women we work with." The campaign is most active in Manchester and Liverpool, and has the support of various local groups including:- migrant rights organizations, trade unions, trade Councils, Universities, pensioner groups, and religious groups. It is led mostly be people themselves at risk of detention. Political representatives, particularly from the North West Region, have endorsed the campaign, including several Councillors, MEPs, MPs, and the shadow immigration Minister Afzal Khan. Liverpool MP Dan Carden recently spoke against detention and in support of the campaign at the recent Liverpool Together Against Trump rally.